Arran loved this huge bouncy web. Heading off into the distance. Waiting for the rest of us to catch up. 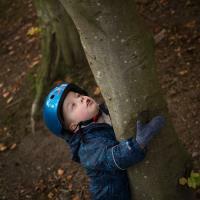 Clambering on fallen trees - he's fascinated by them. Engine room - he saw a spanner on a bench and wanted to start tinkering. More Riverside Roof, with a side of reflected tall ship. Arran loved this carriage from the Glasgow Underground and checked my ticket for me. 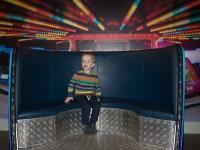 Waltzer - we watched a model and set on this pretend seat and screamed "wheeee". "Look, it made a splash". Surveying slippery ice with suspicion. The bats are the highlight - Arran has a book called "Superbat" and he said this one was Superbat himself. 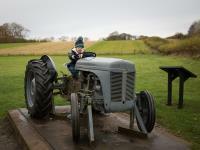 There was lots of tractors at the National Museum of Rural Life - this is the only one Arran was allowed to climb on. The wheels turn though, which is pretty exciting. Arran looks delighted as the calf just licked him! Arran pretending to lick the calf back. A happy tractor driver, finishing off a lovely day out.